I’m in San Francisco at the moment, spending some quality time with the rest of the Yammer crew and chatting about what we think might happen over the next year. It’s nice to be back. 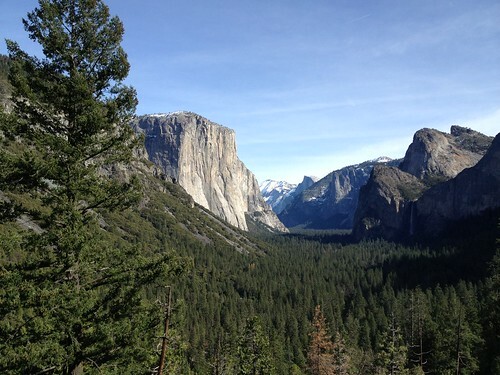 Thanks to Rav, we headed to Yosemite today to see the amazing sights and breathe in the crisp air out there. It was stunning and well worth the extra hours on the bus to make the journey. On the bus, we had a guide who explained one story which really spoke to me. He talked about the Valley Cong, a group of six friends that essentially reinvented the sport of rock climbing in the 60’s and 70’s in Yosemite. The thing which struck me about this was that out of this group of six, two of the members have gone on to found the companies Patagonia and The North Face. I love the idea that these six people, through their love of good craft and rock climbing, reinvented how their sport worked. The founder of Patagonia, Yvon Chouinard, has been especially fantastic to listen to since I got back and loaded up a couple of YouTube videos. I liked this short video below, where he speaks about the patience and zen approach required for Fly Fishing. It’s great to apply those lessons he speaks about to the world of business, which is what he himself tries to practice with Patagonia. I’ve been keen to listen to the wisdom of Warren Buffett more and more lately. I’m not too sure why that is, but there is something very soothing and enjoyable about listening to his ideas and thoughts about life and success. He has a way of speaking in a way that’s very easy to understand and digest. Today, I caught this video of his. It’s an interview he gave to an MBA class some time ago. In the first 5 minutes, he simply says that he wants to share something quickly and then answer the questions they have for him, because that’s always more useful to everyone. However, the ‘something’ that he shared in the first 5 minutes was quite profound and so it’s something I’d like to share today. Today is Australia Day. Rose, Kyle, Marty and I started off the day with a swim in Sydney Harbour, called the Great Australian Swim. It was a 750 meter swim, out and back, starting from the Opera House. 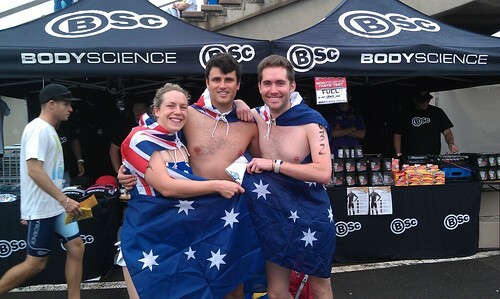 Of course, we swum it in our Australian swim wear and even managed to make the full distance with the flag on our backs. It scared the hell out of me…I’m still fairly new to this open water swimming caper! There’s a group of young people who have just recently formed a group whose mission is something I think deserves a lot more support than it currently gets. The organisation is The Young Centenary Foundation. Science, as we all know, is a fairly important part of our society. Science informs many of the behaviors and actions we take as a people. It helps us discover what it means to be human. It helps us to stay healthy. It helps us to stay sane. Unfortunately, whilst the endeavors of the scientific fraternity are technologically progressive and experimental, the structures around that research and progression is not. Science is still, largely, carried out today the same ways it was carried out decades ago. A core part of this is the presence of university students who decide to do a PhD on a very specific topic of research, in the hope of discovering something and being published. Our initial ideas of people who are doing a PhD is one of grandeur and prestige. This is true, in many respects, but also untrue in many others. One key problem facing many PhD students is that of funding. They are ‘paid’ a measly stipend of somewhere in the range of $20-30k a year to toil for much more than full time in a lab running their experiments. This doesn’t sound too bad, until you consider that fairly standard scientific PhD can take up to 4 years. For most talented scientists, the opportunity cost suffered from turning down plum corporate jobs for 4 years of hard work on less than minimum wage is too hard to refuse. Only the truly dedicated take it on. And then, as if that wasn’t already hard enough, a student can work for 4 years and get close to achieving a break through before their funding is cut and they’re forced to move on from their work. I dare not think of all the great work that is left 90% completed in labs all over the country (indeed, the world) because a student couldn’t secure funding to fully complete their study. That’s where the Young Centenary Foundation comes in. It’s been formed by a core group of young scientists, philanthropists and media professionals under the age of 35. They plan to raise money to contribute towards PhD students working at the Centenary Institue, so they can finish the work they started. They’re not planning on making them rich…just making the process of completing a PhD a little easier. From their Facebook page. Most young scientists are unfortunately unable to continue the work they start at Centenary Institute during a PhD because government and university supported post-doctorate funding is hard to come by. For this reason, one of our mid-term goals is to fund a post-doctoral research position (approx. $80,000 per year) for a young scientist working with a disease that affects young people. $80,000 a year is a lot of money, but a drop in the ocean that is scientific funding. I look forward to supporting the Young Centenary Foundation in the ways that I can this year and encourage you to take a look, too. Congratulations to the crew behind founding it, and to the Centenary Institue itself for driving such a positive change in the way science is conducted here in Australia.